quick recipes for kids. easy recipes for kids. The most common issue that all parents face is to make their child eat. Most children are fussy and picky eaters. Home cooked Indian quick kids recipes are far better than packaged foods as they contain hidden fats and unhealthy ingredients. Atleast you should know what your kid is having. It is important to make sure their body is supplied with all the different nutrients in adequate quantity for their normal growth and development. We have also provided many healthy quick kids recipes. Know your child’s preference and prepare meals revolving around those ingredients. Also, since they are extremely active, they get hungry at the most unexpected time. 17 Items to stock up your kitchen for Quick Kids food. Blend in some ingredients to make a lip-smacking smoothie or milkshake, combine different vegetables to make tikkis or cutlet or just spread some chutneys or sauces to make quick rolls and sandwiches. Here is a range of easy to make, quick delicacies for all the different occasions, which will surely help you to resist serving them packaged food. Make snacks you can be sure that kids will eat and come back asking for more! Cutlets and tikkis come handy when you want to quickly make a filling snack. They can be made by combining various ingredients and are extremely versatile. Some can be shallow fried while some you can deep-fry. To give a crumbly texture, coat them in semolina or breadcrumbs before cooking. Noodles in any form are loved by kids. Mix some vegetables with boiled noodles to make these yummy Noodle cutlets. Got some boiled corn and potatoes? Treat your little one’s with these easy to make melt in the mouth crisp yet cheesy tikkis. Instant dosa, chilas and savory pancakes are other delights that you can whip up quickly. Just mix the semolina along with some vegetables and cook delicious Semolina pancakes in less than 10 minutes! Skip the old boring sandwich and try some unique delicacies to surprise your little one’s! If you have some leftover idli batter post last night's dinner? Mix in some grated carrots to make spongy Carrot dhokla. You can even customize them and add vegetables which your child loves. Grated beetroot, chopped capsicum are other great options too. Also, if you have leftover rice then you can transform them into pizza flavored rice. How can anyone resist pizza or anything flavored with pizza? Try this quick recipe with crunchy vegetables for your kid’s tiffin! Kids love 2-minutes noodles! How about tossing in some vegetables to make it healthy and colorful! We guarantee a clean tiffin box in return if you send them the vegetable Maggi. With summers approaching, make these refreshing beverages for your kids to savor upon. A rich source of calcium and iron, make this amazing banana smoothie for your kid’s breakfast. You can even try combining children’s top favorite food- nutella and Ferrero rocher to make a luscious milkshake. 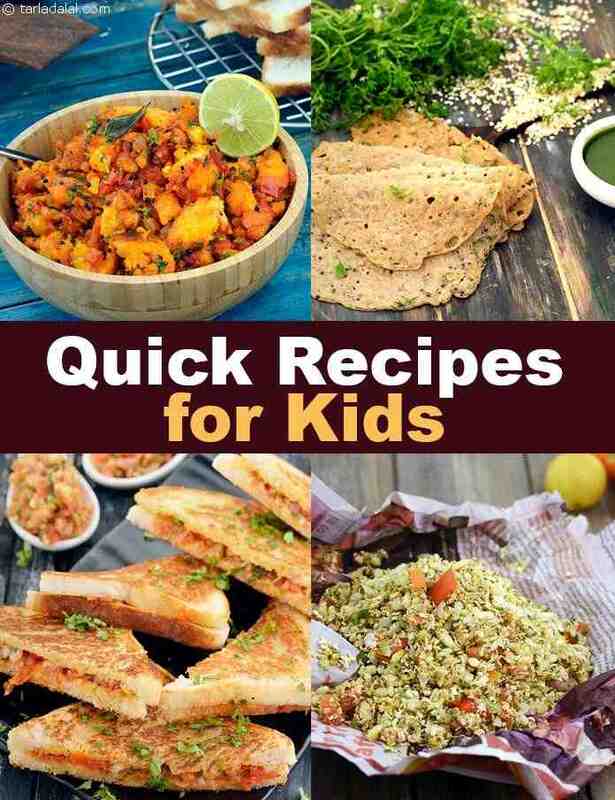 Enjoy our quick recipes for kids collection below. Date cream cheese will fulfill your baby’s daily calcium requirements, as babies by the time they are 7 months old tire of milk. This recipe almost fulfils your baby's daily requirements of calcium along with that of vitamin a. Love the collection of quick kids recipes. My kids love the Nacho Chips and Paneer Fritters. Thanks. Tarla Dalal Meena, glad you enjoyed the collection.